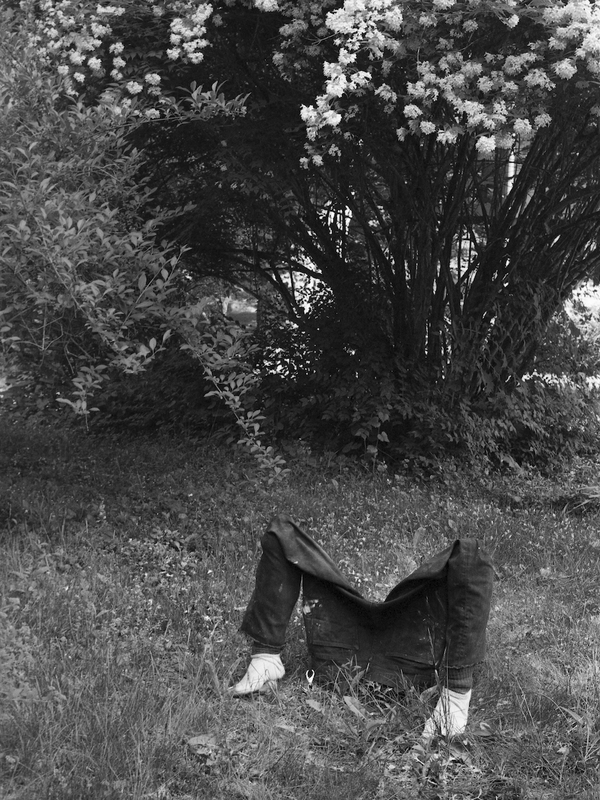 Dan Herschlein — g a macura inc.
Herschlein's photo series shows partial bodies in transit through settings of suburban quietude. Working primarily with sculpture and installation, he reflects the uncanny horrors of everyday life with wry humor. Courtesy of the artist and JTT, New York. "I was reading about conversion disorders, which is a kind of old-fashioned psychological thing, where a past trauma, whether it’s physical or psychological, manifests in the body with unrelated symptoms, like an arm will go numb with no physical cause except that it’s a blocked pathway or something in the brain. The body parts that I’m thinking about, for me, they’re not dismembered—they’re just isolated. . . . I’m thinking about how emotions haunt bodies, and then bodily emotions haunt houses and rooms and furniture." Lehrer, Adam. Contemporary Art Unsettles In Show At JTT Gallery Curated by Dan Herschlein, Forbes. August 7. Creahan, D. New York - "Beside Myself, Curated by Dan Herschlein" at JTT Through August 3rd, 2018, Art Observed. August 2. Piejko, Jennifer. Critic’s Guide: Los Angeles. Frieze.com. January 24. Positions Sector at Art Basel Miami Beach. ArtInfo. November 28. Gil, Virginia. The must-see Art Basel Miami 2017 Galleries. Time Out New York, November 20. Yerebakan, Osman Can. Dan Herschlein and his Living Sculptures. CRUSH Fanzine. April 7. Hilsman, Michael. Dan Herschlein's 'Safe As Houses'. Riot Material. March 22. Scheldahl, Peter. Dan Herschlein: Review. The New Yorker. March 20. Dan Herschlein: Review. Artspeak. March 7. Tsou, Jasmin. Portfolio by Dan Herschlein. BOMB Magazine. March 2. Weiss, Haley. The Disquieting Artist. Interview Magazine. January 3. Heinrich, Will. What to See in New York Art Galleries This Week. The New York Times. December 16. Lesser, Casey. 15 New York Group Shows You Need to See This July. Artsy. June 28. Nunes, Andrew. Air Travel Anxieties Get a Group Show. The Creators Project. June 27. Steadman, Ryan. 9 Things to Do in New York’s Art World Before June 17. Observer. June 13. Escalona, Rhazes Pacheco. Worm by Daniel Herschlein, lo siniestro doméstico. Luster. May. Steadman, Ryan. 8 Must-See Satellite Art Fair Booths in Miami, The Observer. December 1. D’Agostino, Paul. Screw You: Surface Support, Brooklyn Magazine. July 29. Farley, Michael Anthony and Kirsch, Corinna. This Week’s Must-see Art Events: Authenticity as Commodity. Art F City. July 13.
Who Won New York’s Frieze Week 2015?, The Observer. May 19. Chu, Christie. 8 Great Booths to Check Out At NADA Art Fair, Artnet. May 15. Steadman, Ryan. The Body is Back at the 2015 NADA Art Fair, The Observer. May 15. Emerging Artists Hang with Top Collectors at NADA’s Best Edition Yet, Artsy. May 15. Artists to Watch at NADA New York 2015, Artspace. May 8. Daly, Hannah. Artist as Art. ARTslant. September 4.